I'm much younger and much faster...and I'll tear you apart!" You wouldn't want to get on the wrong side of David Callan. A ruthlessly efficient killer with a military and criminal background, he was once the top operative for a secretive branch of government intelligence known as 'The Section' and continues to work for them only because he has been blackmailed into doing so. He tends to hold grudges and his respect for authority is tenuous at best. He has a particular loathing for his primly superior former colleague, Toby Meres, and his first act on being forcibly re-hired is to warn his own boss that he'll kill him if he pushes too hard, a threat he is clearly willing and able to carry out. He has his own way of working, which usually deviates from the departmental norm and regularly buys in the assistance of nervous and malodorous burglar Lonely, with whom he shares an uneasy kinship and for whom he acts as unofficial protector – mistreat Lonely and you can expect a visit from Callan that you won't forget in a hurry. 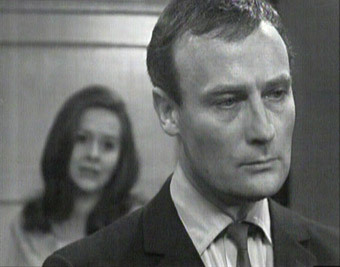 Callan was a series that made a household name of its star, one Edward Woodward, who I'd hope would be remembered for more than just The Equalizer and that silly gag about the frequency of the letter D in his name. He was, without question, an actor of extraordinary screen presence, his precision-snapped delivery and authoritative manner often employed to suggest a man who is used to getting his own way and who does not suffer fools gladly. It's an attitude he was later bring to bear on two of his most memorable big screen roles, the religiously uptight Sgt. Howie in The Wicker Man and the defiant title character in Breaker Morant. But nowhere will you find a more arresting incarnation of this persona than David Callan. Woodward is consistently extraordinary here, a coiled spring of suppressed and lethal anger, which is held in check by a professionalism that acts as a straight-jacket for his emotions and personal morality and enables him to operate like a precision engineered machine. This savvy casting extends to the supporting players, with Anthony Valentine bringing an antagonistic sense of self-superiority to Callan's professional nemesis Toby Meres, deliberately provoking his colleague in a manner that emphasises the polar opposition of their social backgrounds. 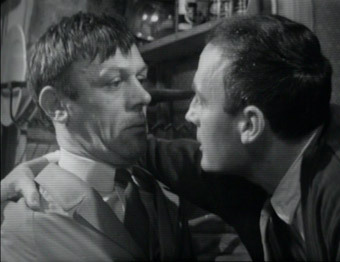 But Meres is also an operative of considerable skill who appears to take perverse pleasure from the more brutal aspects of his job; his hatred of Callan as a person is heartfelt, but he still respects him as an operative and fears him as an enemy, and just occasionally we're given a glimpse of the professional kinship that lies buried beneath their mutual dislike of each other. Completing the trio of series regulars is Russell Hunter, who rises to the unenviable role of Lonely, a foul smelling and constantly nervous small-time crook and the only man Callan appears willing to trust. The Section is run by a man officially referred to only by his code name Hunter, a position held by four different individuals during the five years that Callan ran for, but initially occupied by Colonel Lewis, the man who trained Callan and later removed him from active service. He is played with unflappable authority by Ronald Radd, who also appeared three times as Steed's boss in The Avengers, a series that Callan creator and key writer James Mitchell contributed five scripts to and that Callan itself was partly a reaction against. Coming back to the programme after several years and having recently soaked myself in the cheerful thrills of The Avengers, I was struck by how dark a series this is and how hard it is to imagine a modern equivalent being green-lighted by the television executives of today. These are consistently downbeat stories of dirty work carried out for and by the British government under the cover of secrecy, work in which people are mistreated, manipulated, emotionally scarred and even killed by men who have either lost touch with their conscience or are tormented by it. The cold war background may date the setting, but this is still in some ways chillingly contemporary stuff. The premise and lead characters first saw the light of day in the one-off television play, A Magnum for Schneider, which first aired in February 1967 as part of the prestigious ATV drama series Armchair Theatre. The first episode of the series proper followed in July the same year. Whether this continuation was planned from the start or developed as a result of response to the Armchair Theatre play is uncertain, but A Magnum for Schneider certainly plays like a pilot episode and it's a sign of how well written, well cast and well produced it was that no major changes had to be made to accommodate its expansion into the series format. As with series 1 of The Avengers, some of the early episodes have been tragically lost, and I choose the word tragically with good reason here. This is television drama of the highest order, daring, intelligent, brutal when it had to be, and there's not a single even remotely duff episode here – play one and you'll be itching to watch the next, and by the end will be mourning the ones you'll now never see. Collected here on this four-disc set are the original Armchair Theatre play A Magnum for Schneider and all of the surviving episodes from series one and two, unseen for almost forty years and released here for the first time on home video. Their condition varies, but there are no major issues and frankly I couldn't care less if some of the episodes look a bit rough around the edges – this is marvellous, darkly compelling television, made at a time when risks were encouraged and creativity fostered. It's been many, many years since I last watched some of the later episodes, and while the iconic swinging-bulb title sequence and Woodward's electrifying central performance have stayed with me, it's something of a joy to discover that there's so much more to appreciate here, from the consistently high quality of the writing to the always impressive supporting cast. It is, it turns out, everything I remember it to be, and a whole lot more. Ex-Section operative David Callan, forcibly retired some years earlier for letting his conscience interfere with his work, has been brought back into the fold by section chief Hunter to eliminate a German businessman and illegal arms trader named Schneider (Joseph Fürst), whose office is located in the very same building in which Callan now works. Although written by James Mitchell for Armchair Theatre, A Magnum for Schneider sets the tone for pretty much every episode that followed – watched retrospectively it even answers a couple of questions that the series itself bypassed. All four of the recurring characters are introduced and firmly established here by a cast who would, with the exception of Peter Bowles as Toby Meres, go on to repeat their roles in the series proper. Fans will find themselves of very familiar ground here – it even has the same the moody, stick-in-your-brain theme music (a library track entitled 'Girl in the Dark' by Jack Trombey, as it happens). 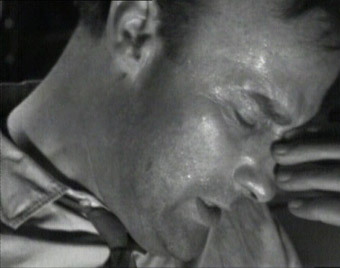 Both a retread of A Magnum for Schneider and a follow-on, the very first episode of the series proper replays Callan's recall from forced retirement, but this time to keep an eye on former SS officer Strauss (Powys Thomas), who is posing as a Greek Cypriot businessman named Stavros. Having secured a position as his book-keeper, Callan is ordered to find conclusive evidence of the man's true identity and keep him alive until he is handed over to the Israelis. A superb early exchange of threats between Hunter and Callan pretty much defines their relationship from there on in, while the speed and machine-like efficiency's of Callan's search of Strauss's private quarters speaks volumes about his singular skills as an operative. The downbeat ending gets the series off to an appropriately dark start. When Lonely is beaten up after robbing a supposedly empty flat, Callan investigates on his behalf and discovers a link to a man named Pollock (Jon Laurimore), an enemy operative with whom he has had past dealings and who is currently under the Section's protection. After spotting Toby Meres leaving a safe house in which Pollock's girlfriend is holed up, Callan bluffs his way in and gets the operation details from her, then drops in to Section HQ to warn Hunter to keep his boys away from Lonely; unfortunately for just about everyone, Meres has already paid him a visit. It's here that Callan's protective attitude to Lonely is most vividly exposed, in the swift but brutal beating he administers to the first attacker and his carefully planned response to a second, more violent assault dished out by Meres. 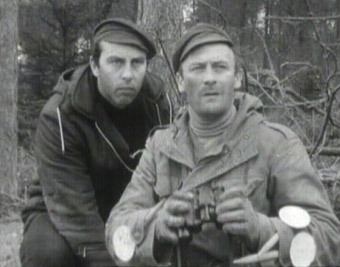 Callan is brought officially back into the Section by a new Hunter (Michael Goodliffe), who accompanies him and Meres to the airport to collect Russian defector Bunin (a convincingly accented Duncan Lamont) when he arrives on British soil. Callan doesn't believe a man like Bunin – one of their top executioners and a man he was once sent to kill – would ever defect, and suspects he has actually been dispatched to investigate and even kill the new Hunter. Once under Section protection, Bunin claims he is actually here to pave the way for the defection of top government official Ivan Mereski, a potential prize catch who will only defect to the Section's top man in Russia. It may be a little obvious to us what Bunin is up to, but the real interest here lies in the process of its investigation – Hunter's use of foreign office bod Hanson (John Savident) is particularly intriguing – and the distrustful manner in which Callan and Bunin interact. A tightly structured cold war story that sees Lonely employed to tail a man whose existence is not even certain and Meres authorising the use of Callan's file photo for Section target practice. Callan is ordered to investigate Joan Mather, a government laboratory scientist who has expressed concerns that her work might be used for biological warfare. Lonely is once again engaged to tail her and Callan convincingly engineers a chance meeting at a concert to charm his way into her flat. 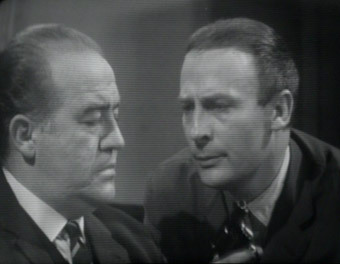 In a splendidly timed reveal, Meres appears from nowhere as the boyfriend of Joan's flatmate Sophie, sparking the sort of frosty teamwork that emphasises both the rivalry and no-nonsense professionalism of both men – you really do get the sense that if they could put their dislike for each other aside they could be a combined force to be reckoned with. Under instruction from Hunter #2, Callan accompanies Lonely on a targeted burglary ("Like it?" "Lovely." "Nick it.") of a house owned by Polish émigré Sophia Rule, who remarried after the death of her first husband Andrei Brezhevski. Only it turns out that he's not dead after all. Having provided Callan with this information and no more, Hunter dismisses him with the full knowledge that he'll investigate anyway. 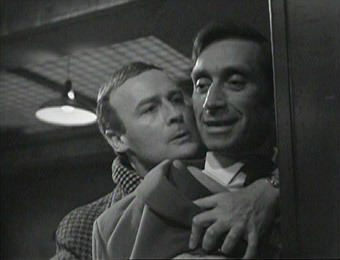 This he does, shadowing and casually ingratiating himself with Sophia and using Lonely to make contact with Polish anti-Communist Diser – a typically lovely turn from favourite character actor Vladek Sheybal – who reveals that Brezhevski is a figure of some power in the East and just the sort of person the Section would like to get their hands on. More solid East-West espionage in which Diser gets a lesson in the keenness of Callan's instincts when he foolishly tries to jump him, and Callan's inner conflict over his job are brought sharply to the fore. Following an opening that I can't reveal without spoiling the ending of the previous episode, Callan and Meres are dispatched to collect the section's new Hunter (Derek Bond), a man Callan trained with and clearly holds in contempt. The problem is that he's been stationed for some time in East Germany and the two operatives have been ordered to assist his escape, a process that requires them to dodge enemy patrols and navigate a mine field. A smart little espionage movie in its own right, this tense and tightly wound tale includes a far higher percentage of location work than usual and showcases the fractious relationship between Callan and Meres at its most productive. When a French counter-intelligence agent Jean Coquet dies in an engineered road accident, the Section is asked to investigate why he was on British soil in the first place. As an old friend of Coquet's, Callan is ordered to look after his widow Francine, while a bored Meres interviews ferry workers who may have seen Coquet cross the channel and is knocked out for his trouble. Callan's soon nursing a head injury of his own when Francine is kidnapped while under his protection. Could the answer to what is really going on lie with the nervous Frenchman who is waiting with Lonely back at Callan's flat? Another small peek is provided into Callan's past, though not enough to damage his enigma in any way, and we get get to see just how hard he will push even people he likes to get at the truth. Colonel Leslie, aka Hunter #1, returns with orders for the Section to a stop British army brigadier named Pringle (Allan Cuthbertson, an actor who specialised in officious roles) from accepting a job training soldiers for the sultan of Abu Tafa, an oil rich but unstable Arabic region. Callan is already on the case, posing as a tramp to procure work from Pringle through his daughter Sarah (Tessa Wyatt), who runs a soup kitchen for the homeless. But this is no chance paring of operative and target – Pringle was once Callan's commanding officer and the man who had him discharged from the army, and Callan still holds a serious grudge. Taken on as Pringle's manservant, Callan bugs his phone, befriends his daughter and keeps a tab on his guests, who include a young Saeed Jaffrey as Abu Tafa agent Dr. Megali. Some great character scenes here, not least when the plum-voiced Meres passes himself as Callan's blokey mate, and there's even a few light-hearted moments when Lonely is called in to blow Pringle's safe. A Russian spy is captured and Callan takes his place, making contact with incumbent agents Eric Marshall (Harry Towb) and his daughter Nadia (Angela Morant), his mission being to track down and kill the ring's organiser Belukov, a man with whom he shares a bitter history. In a break from the series norm, we have two genuinely sympathetic enemy agents in the shape of Eric and Nadia Marshall, whom Callan later goes to desperate lengths to protect from arrest. Earlier signs that Meres has a gleefully sadistic streak are confirmed here in his interrogation of captured Russian agent Ross (Roger Bizley), who he ties to a chair in the Section's firing range and cheerfully questions while shooting bullets past his ear and belting him with golf balls. Callan is investigating an enemy plot to kill Hunter #3 when he's unexpectedly arrested for espionage by another branch of the service with a reluctant Toby Meres in tow, who has been ordered to assist by Hunter himself. When Meres reports back to base, however, Hunter claims to know nothing of the request and it quickly becomes evident that Callan has been taken prisoner by enemy agents. A gritty take on The Manchurian Candidate focuses largely on the process of breaking and brainwashing Callan to turn him into a programmed assassin for the other side. A tense and compelling episode, convincingly sold by strong performances across the board and building to an ending in which that buried bond between Meres and Callan is finally exposed and that really does leave you wondering where the hell the series will go next. Like the early Avengers episodes, Callan was recorded on monochrome 405 line VHF videotape cut with exterior location footage shot on 16mm film. Unseen for many years, the quality is never going to be pristine, but for the most part the image is stable, the detail reasonable and the contrast range a little more forgiving of shadow detail than Optimum's Avengers transfers, the trade-off being that the black levels are often not as solid. A Magnum for Schneider, The Good Ones Are All Dead and You Should Have Got Here Sooner are visually the weakest of the bunch, with image blurring and ghosting, visible evidence of the original line resolution and even the odd bit of wobbly picture geometry. Tape damage and blips are intermittently visible throughout the series, but are rare enough not to be a major issue. On the early episodes particularly, the film inserts are considerably less sharp than the video. The mono soundtrack is a lot clearer than you might expect, despite the inevitable restrictions on dynamic range. In common with the picture, the recorded sound quality on film inserts on the early episodes is noticeably weaker than the studio material. Genuinely classic television in every respect – great writing, superb performances and a darkness of tone that modern TV dramas can only dream of equalling. No supplementary features on Network's 4-disc set and the picture quality is a little wobbly in places, but just this once you'll not hear me complaining. For the show itself, this still has to come highly recommended.